In my interviews with Churches, not only did they have the chance to ask me questions but I had the chance to ask them questions. This is always an enlightening experience to a pastor. It can reveal to me several vital pieces of information about a Church. I often ask about leadership, former staff, expectations and their struggles. Inevitably there will be a discussion about the events that a Church holds each year. Each Church seems to have a series of traditional events that they do every year. Some Churches do a summer Vacation Bible School (VBS), some Churches have special holiday gatherings and still other Churches have special youth or children’s programs. The list of possibilities is long. The follow-up question for me is, “And what is happening now?” The excuses flow. The blame often falls on busy schedules, poor parenting or some lack of commitment. So the Church began holding the same event every year. The same program was recycled year after year. It became a standing tradition in the Church. It is an event that we hold every year. Something sad happened along the way. The membership of the congregation changed. The make up of the community changed. Schedules of families changed. Needs of the people changed. All the while the program stayed the same. Now it is not successful, but we keep right on doing it and hoping that one day it will be successful again. All traditions are built on past success. I appreciate those victories. I applaud those visionaries servants. The hard question to ask is if it is still successful. If not, who has the courage to kill it and start something new. But know, one day we will have to kill that program too. One of the biggest questions I received during my interviews with several Churches (other than about worship) was, “What is the biggest thing you have learned about ministry through the years?” My response is so simple that one search committee member kept asking for another answer and got agitated when I told him the same thing over again. It seemed that every Church wanted me to give them some steps that I would perform to help grow their Church. Honestly, there is no such thing. There are similarities between what Churches are doing that we can learn from, but that is about it. My first Church grew because of a group of people began inviting their friends and family. My second Church did not grow through the same approach. The next Church I lead in Indiana grew through having big days that people could invite their friends too. The new Church I lead in Iowa grow through advertising and through me performing hundreds of weddings. Here in Alaska the growth has come through my family and I being out in the community. Honestly, there is very little that has transferred from one Church to another. Each community has unique needs, unique people and each has a unique background. Each Church has its own unique history, its own unique people and its own unique experience. For example, in the Church in Indiana I had a couple who invited almost all guests out to lunch each week at a local buffet. When they moved, the Church changed and we need to create a program for guest follow-up. That couple personally had a bigger hand in our growth than anything I did. The struggle in Church is not to become like a Mega Church that we admire. The struggle is to utilize the way God has gifted us in the community that God has placed us. Well, first let me say that every Church I interviewed with had an average attendance of under 300. So the first thing that caught me is that many “average” Churches are still fighting the “worship wars” week after week. An average Church to me are Churches under 300 people that have not been started in the last 15 years. Church leaders may want us to think the issues of worship are a thing of the past, but they are very, very real. I mean, is it really the worship of God when I stand smugly happy that we are singing a song that I like? Does it really glorify God when I refuse to sing a song because I do not like the style? So my response to the question about worship was always the same, “I sing and use music that glorifies God.” That means that sometimes I use a hymn and sometimes I use an older chorus and sometimes I use a new song and sometimes I use a combination of old and new together. I have used children’s songs right along with adult songs. I use everything that people have written down to glorify God. Honestly, I firmly believe that if we try to glorify God in all that we sing then the style of worship becomes irrelevant. I do not want a worship service that is traditional or contemporary. I want one that is God honoring in every way. Several years ago I ran across a verse of scripture that has guided my preaching and teaching. It is a simple statement that the Apostle Paul makes to the elders from the Church int he city of Ephesus about his teaching while he was with them for three years. What caught me in this verse is that Paul states that his preaching was designed to be “helpful.” His goal was not necessarily designed to be witty, insightful, enjoyable or deep. When he taught the word of God it was with the aim of being helpful. 1. Does this HELP people to know God better? 2. Does this HELP people to know God’s word better? 3. Does this HELP people to live out their faith? 4. Does this HELP people love each other more? 5. Does this HELP people to grow in Christ in any way? I firmly believe that every time God’s word is proclaimed we need to have a practical element to it. We are not just presenting people with the Bible, but helping them in their relationship with God and with one another. 1. Does the Bible address this situation? 3. What is the wise thing for me to do in this situation? 5. Can you live with the consequences of this decision? The chances are if you are a Christian that most of these questions we ask all the time. There is also a great possibility that we neglect one of these questions and it affects our decisions for the worse. My prayer is that these are a simple grid people will use to help themselves make great and Godly decisions. I could spend hours and hours talking about the show and some of the finds. Lately I have noticed some things in the show that have me thinking about how we share our faith. If you have seen the show you know that one of their favorite things to do is go “free styling.” That means they have no plan of who they going to buy from rather they just drive around and stop at any house that looks like it might be loaded with items they would want to buy. Now, I am sure the show is edited for TV and sometimes they get rejected, but many times they do not. Some person will come to the door with their arms crossed or saying “we don’t want to buy any.” Over the next few minutes they work to breakdown barriers and unfold people’s arms. As I watched this week I thought about how we are often required to so the same thing when we share our faith. 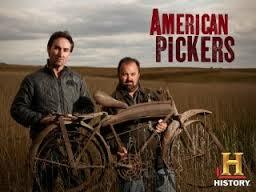 So here are some lessons I see from watching Mike and Frank on American Pickers. 2. Ask them about themselves and let them share their story. Once they state their purpose they ask the people about all of their stuff. How long have you lived here? What is the family history? They rarely begin by talking about items. With their purpose in mind they try and get those arms uncrossed and the mouth moving. 3. Show interest in the person and their things. If a person is into something particular they focus the conversation on that item. Some people collect toys, others collect bikes, some collect signs, and other collect everything. When someone is interested in an item they will talk about it for hours. This breaks down the final barriers and opens the door to ask about prices. People want to talk about themselves and the things they enjoy long before they get any kind of sales pitch. 4. If you hit an emotional nerve, its okay to back away. Sometimes they will come across a piece given to the owner by a relative or friend. Seeing they hit an emotional nerve, they simply move on to another item. Everyone has areas they are sensitive about, we need to be keenly aware of it. 5. Not every encounter will be a big score. Sometimes Mike and Frank find a huge item and buy it cheap and make a huge profit. Often they buy smalls and make just a few bucks, but if you have watched the show long enough, they often return to the same place in the future and pick again. Honestly, I rarely share the gospel in its complete form. I usually say a line here and a line there until the day they are ready for that big talk. One positive impression for Christ is better than none. If you watch the show, pay close attention to the people skills that Mike and Frank have developed when they talk to strangers. It might help you to improve your skills in sharing Jesus with anyone. I recently read an article that one set of men’s lesson material is getting an update. It is material directed specifically at men, their needs and their style. Their new video format has three teachers in a “man cave” drinking coffee and sharing their thoughts on God. It is a welcome change for many, but I fear it is not for everyone. Lately I have come to the very clear realization that there are numerous types of men. The programs that a Church offers need to remember this each week. There are men who are senior citizens, there are business professionals, there are suburban landscapers, there are coffee shop men and there are rednecks. Just look around and you will see it everywhere you go. In fact, I don’t know of anyone who denies this simple truth. The problem is when the Church thinks that it is going to reach and connect with all men the same way. A men’s prayer breakfast is great for some. A coffee-house setting will work with others. A father son event may work for others. And something else may work for another group. Honestly, I think that is the appeal of Duck Dynasty. It is not a group of coffee sipping yuppies, but rednecks who enjoy life like “good old boys,” and for some men that has enormous appeal. I say all of this because I want to see men who come to know Jesus as their Lord and Savior. I want men’s lives to be transformed by he gospel and the power of the Holy Spirit. I want to see men changed by God and for God. The problem is that I connect and lead people best who are like me. While searching for my new job I had the opportunity to do 9 interviews. I told one Church that I am more of a “redneck” than a tie wearing pastor. They seemed perplexed and confused by that statement and asked me to clarify. I told them I would rather hunt and fish with men in the Church than sip a cappuccino and listen to their problems. While I am not sure they understood, they knew they didn’t want to offer me the job. I am okay with that. This is who I am. One of the biggest compliments I have had since I announced that I was leaving was from a man who said he enjoyed coming to church because I was a “real man.” I know what he meant, I am just an ordinary guy like him who loves the Lord. So – Men. What kind of man are you? Find other men like you who can be a good role model. Also find some younger man with similar interests and pour your life into them. And Ladies – What kind of man is your husband? Your son? Do not worry if some groups do not appeal to your husband or your son. Try to find one that does. A Duck Dynasty event may appeal more than a coffee-house for them, but maybe the opposite is true. The Church is a collection of very different people and we need to be careful not to lump all the men together. It has the potential to do more harm than good.